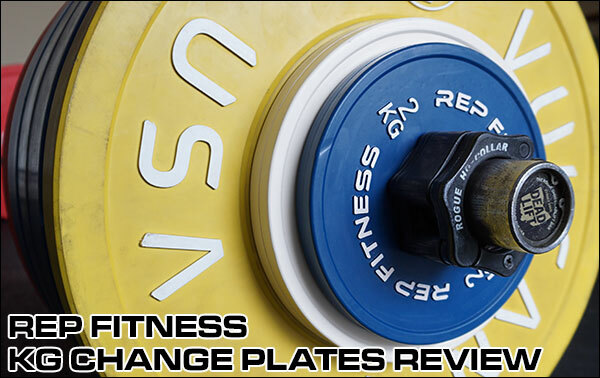 This is a review of Rep Fitness’ new rubber-coated Kilogram Change Plates. While not the most complicated of products to review, the lower pricing and high level of interest in these plates made them worth checking out more thoroughly. 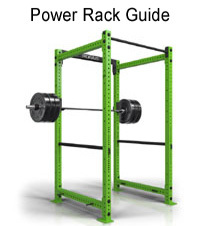 In this review I will cover the basic specifications of these plates, design features, and plate weight (accuracy). I will also make comparisons to other popular rubber change plates out there. If you have questions leave a comment below. Rep’s change plates are really quite standard. They are metal plates with a rubber coating, and they adhere to the standard IWF coloring scheme. The thing that makes different from most other brands is the fact that they have an exposed steel insert rather than that insert being covered in rubber like the rest of the plate. 25 kg set comprised of six pairs of discs. Standard 50.4 mm collar opening. Disc diameter/thickness is on par with IWF-style plates. 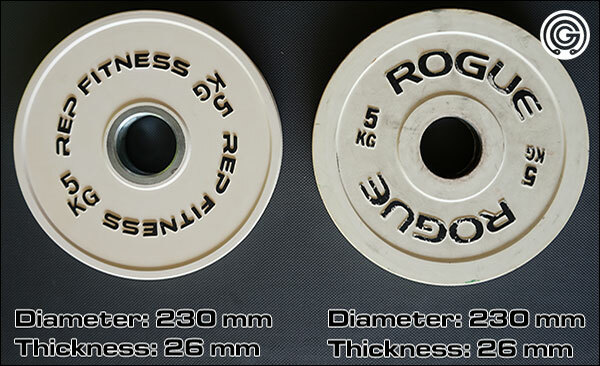 Rogue and Rep 5 KG discs are the same size, as are the 2.5 kg and 2 kg discs. There are a few mm of difference between Rogue and Rep’s smallest three discs, but who would notice or care. Solid in pairs, or as a 25 kg set. Set price: $169 before shipping. 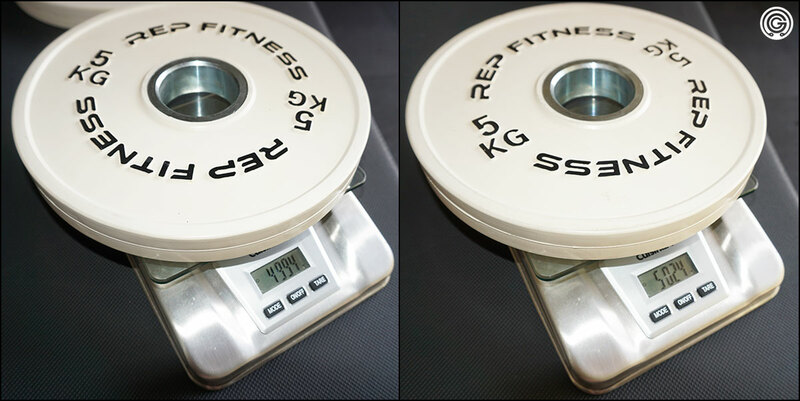 How Accurate Are Rep Fitness’ Kilogram Change Plates? Rep Fitness doesn’t make any accuracy claims for their Kilogram Change Plates. Because of this I made it a point to weigh and photograph the results for each and every plate in the set so that we can guesstimate the overall accuracy. One set doesn’t make it science, sure, but it should paint a fairly good picture of what to expect. It’s helpful to know that change plates that are certified by the IWF are required to be within 10 grams of stated weight. That’s pretty tight; especially on the 2.5 kg and 5 kg plates. Well Rep’s Change Plates are not certified, but as you will see below 8/12 of the plates in my set were within 10 grams, and a surprising number of them were within a gram or two. Deviation is the greatest on my Rep 5 Kilogram Plates, but that deviation is still very, very low (24 grams = 0.48% of 5000 grams). No complaints; especially as you look at the rest of the set. 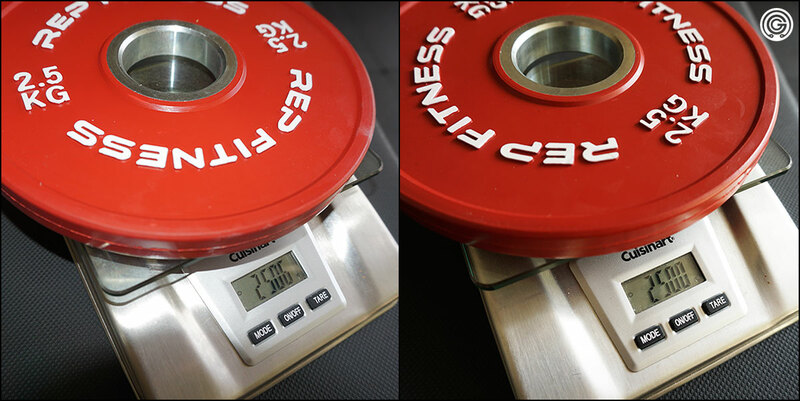 Both of my Rep 2.5 Kilogram Change Plates are very accurate; not only under 1% but within 10 grams. 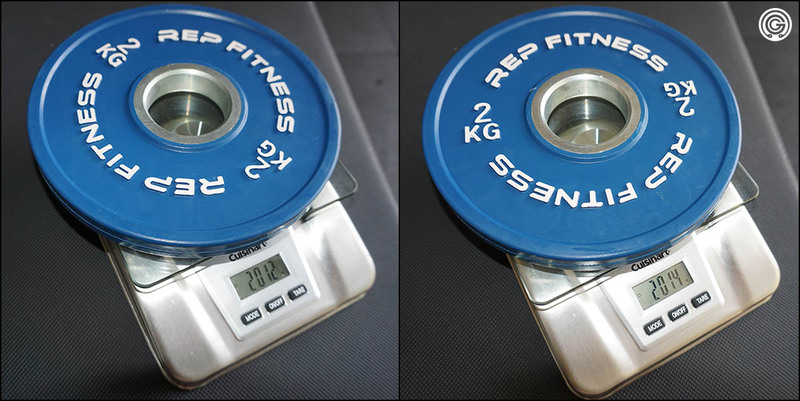 Both of my Rep 2 Kilogram Change Plates are within 1% of stated weight, and only 2 grams apart. Both of my Rep 1.5 Kilogram Change Plates are within 1% of stated weight, with one being nearly perfect. 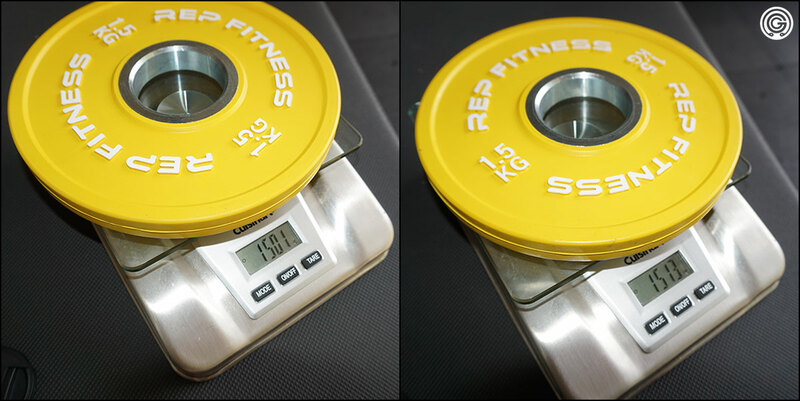 Both of my Rep 1 Kilogram Change Plates are nearly perfect; practically no deviation. 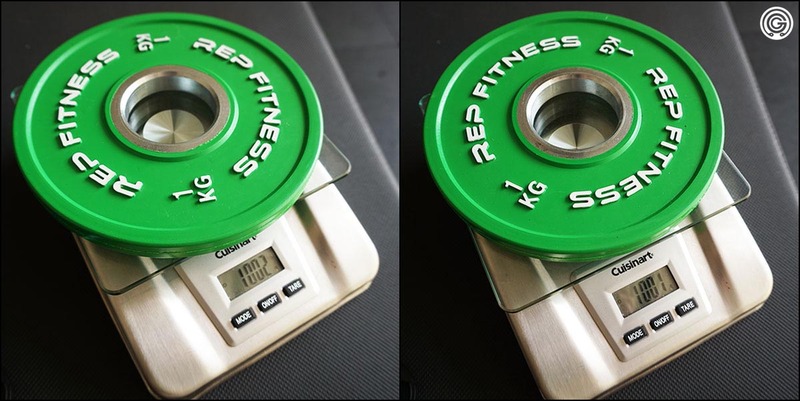 Both of my Rep 0.5 Kilogram Change Plates are spot on at 500 grams. Zero deviation. So even though Rep makes literally zero claims to accuracy (which is usually a bad sign), these plates are pretty damn accurate for the money. Not a single plate was outside of 1%, and 1% isn’t bad at all; especially for a garage gym. So for $169 you can own a 25 kg set of Rep Fitness change plates that may technically be less accurate than IWF-certified plates that sell for $100+ more per set, but when it comes down to it they really aren’t any less accurate (at least in the case of my set.) So what do I mean exactly? Well look at the picture below. Accurate? Sure. As accurate as you’d expect of this particular product? Not exactly. These pricey Nordic plates are certified by the IWF and sell for $277 a set (roughly $200 less than when I picked them up a few years ago). They’re supposed to be within 10g of the stated weight, but as you can see that they are not consistently that accurate. Hell the 1 kg disc is outside of 10 grams and 1%. Not overly impressive for the money, right? You can get the same deviation on Rep’s plates for a lot less cash. Vulcan’s V-Locks have actually proven to be more accurate than all of them; at least in my experience. Vulcan promises 0.5% accuracy which is pretty damn tight as well. V-Lock’s are a solid product, and they are a 100% rubber product, but they are also still well over $200 a set and the discs themselves are very bulky. End of the day, I think Rep is accurate enough for 95% of gym situations. 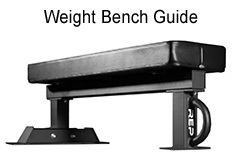 Lord knows a 1% accuracy level is more precise than what you’ll find in any public gym, and it’s certainly way more accurate than your only other cheap option – the cast iron kilogram change plates like those old Pendlay discs or the current selection from Strength Shop USA (both of which are wildly inaccurate). 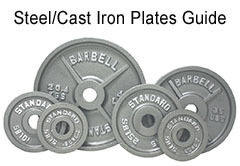 Cast iron discs from Strength Shop USA. Roughly the same set price as Rep, but not nearly as nice. If you’re wondering how these Rep plates stack against Rogue’s change plates, just know that Rogue offers the same plate as the Swedes. They just aren’t certified by the IWF. Check out my original change plate guide for more info on other brands. 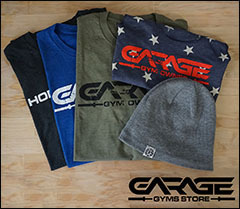 I think the Rep Kilo plates are a steal at $169. Remember that it wasn’t all that long ago that you had to buy either IWF change plate set for close to $500, or cast iron plates that still cost $150 a set, thrashed up your bar finish, and weren’t even accurate. Rogue and Vulcan entering the game drove IWF prices down, and now Rep comes along to make a full set even more affordable than ever. 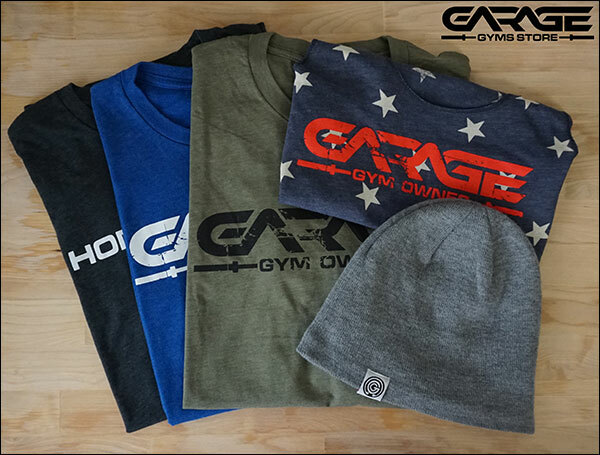 It’s not a bad time to own a garage gym, that’s for sure! 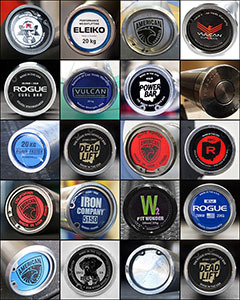 I can only come up with one potential drawback to owning Rep Fitness discs over the other more expensive brands, and that’s the use of a metal hub. I don’t actually think that this is a problem, but for those of you who prefer to use your discs outside of your collars, there isn’t going to be any friction holding these in place without the rubber coating. If that’s something you care about then you may have to spend more on V-Locks, or actual friction discs. The steel hub is nice; machined well and even beveled; but there will be no friction between it and your sleeves, so either use them inside your collars or accept some movement during those sets. But aside from that I highly recommend the Rep Fitness Change Plates. Weight accuracy is more than acceptable, the quality seems high, the colors are vibrant, and the price can’t be beat. These discs can be used for powerlifting in addition to weightlifting, and frankly I think the 6-pair Olympic change plate set is more diverse than the 5-pair powerlifting set anyway; allowing for more fine tuning of the weight for percentage-based training/programs. Appreciate the review! 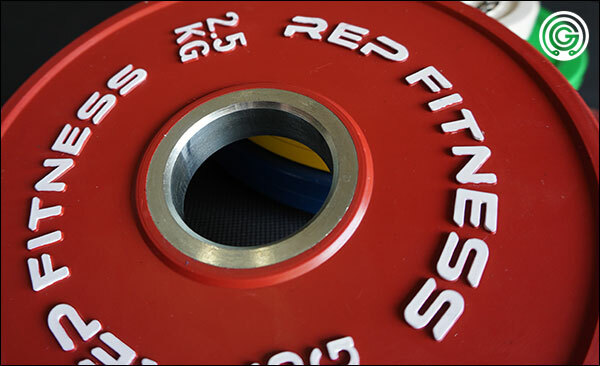 Did you find that the rep plates tended to bounce t and ding up your bar? I have a Rogue LB change plate set and it made quite a bit of a difference compared to normal steel plates, but I’m sure the tolerances are much better on these. Just wondering if the Rep ones are still worth it when they’re not as significantly cheaper than other brands now. Thanks for the help! I don’t find them to be destructive, they do fit much better on the bar than cast iron change plates do. Still, your rubber change set from Rogue is guaranteed to never do damage so they are technically superior all other things (the price) being equal. 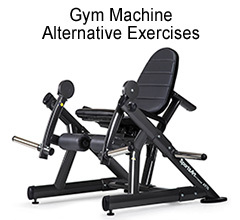 Previous post: Arm Blaster – Are They Worth the Cash?